Owners and operators of solar farms are often surprised by the high cost of on-going grounds maintenance. Weeds and grass can quickly grow to shade solar modules and reduce energy production. Sun Raised Farms ensures that the grass will be kept under control, in a sustainable way. Our farmers are well qualified with experience in raising sheep and providing other grounds maintenance services. Sun Raised Farms ensures that our farmers have proper insurance in place and the right training to work on a solar farm, safety training and we share best practices for grounds maintenance across our network of Sun Raised Farmers. 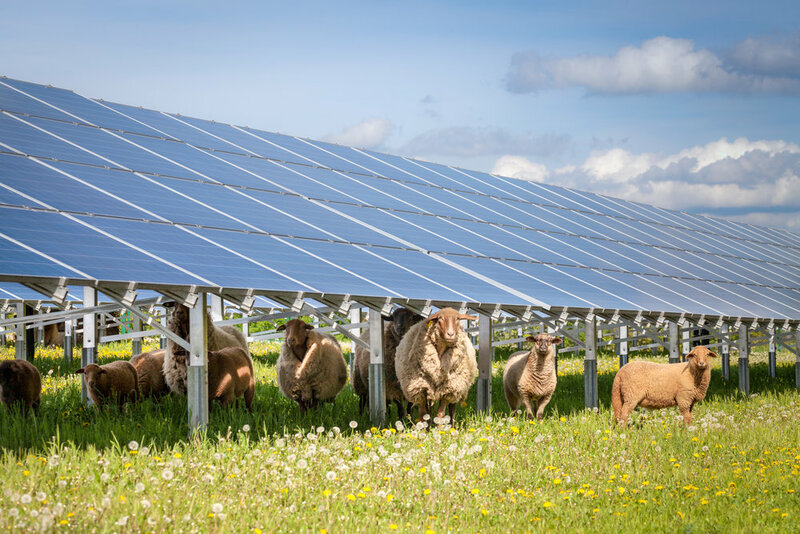 Solar farm owners want to protect their investment from theft or vandalism which could cause a disruption in power production and expensive equipment replacement costs. The farmer will visit the Solar Farm on a regular basis providing extra eyes and ears. In addition, to protect the sheep, the Sun Raised Farmer uses a "herd protector", typically a donkey or great pyrenees dog which provides additional security. Sun Raised Farms is the perfect partner for Solar Farm Developers, Owners and Operators that want to minimize their operating costs and use sustainable methods to maintain their solar farm. Keeping land in agriculture is important to many communities that believe energy generation should not compete with food production. Solar Farm developers who partner with Sun Raised Farms often have more support during the zoning and permitting process, reducing the development timeline and costs of a solar farm project. Sign up with your email address to receive news and updates from Sun Raised Farms and Sun Raised Foods.